It is not often in Burney that one gets an opportunity to hear from someone who has visited Cuba and can give a first hand account. The United States of America is involved in a complex process of normalizing bi-lateral relations with Cuba. On June 20, 2015, the two countries re-opened their embassies and restored diplomatic relations. This historic breakthrough has allowed us to more effectively advance U.S. interests and values with our southern neighbor. Since the re-establishment of diplomatic relations, the United States and Cuba have expanded cooperation in areas such as the environment, transportation, agriculture, health, and law enforcement. Numerous high-level U.S. officials have visited Cuba to deepen relations, including President Obama, five cabinet secretaries, Members of Congress, governors, and mayors. Hundreds of representatives of U.S. civil society, business, and religious communities have also visited. Hundreds of thousands of Americans are interacting with the Cuban people through educational and cultural exchanges for the first time. We have made progress in many areas, but will continue to work through remaining challenges, including human rights, claims, and the return of fugitives. In late March 2016, President Obama was the first sitting President to visit Cuba since Calvin Coolidge. 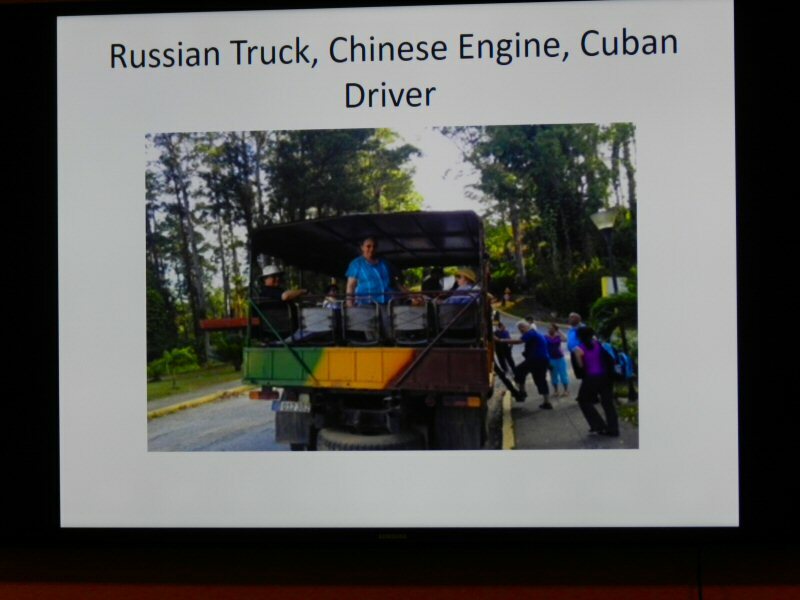 Shortly thereafter, in late April and early May, Catherine Camp, the president of The McArthur-Burney Falls Interpretive Association, had the opportunity to visit Cuba as part of a 32 member labor delegation from California. 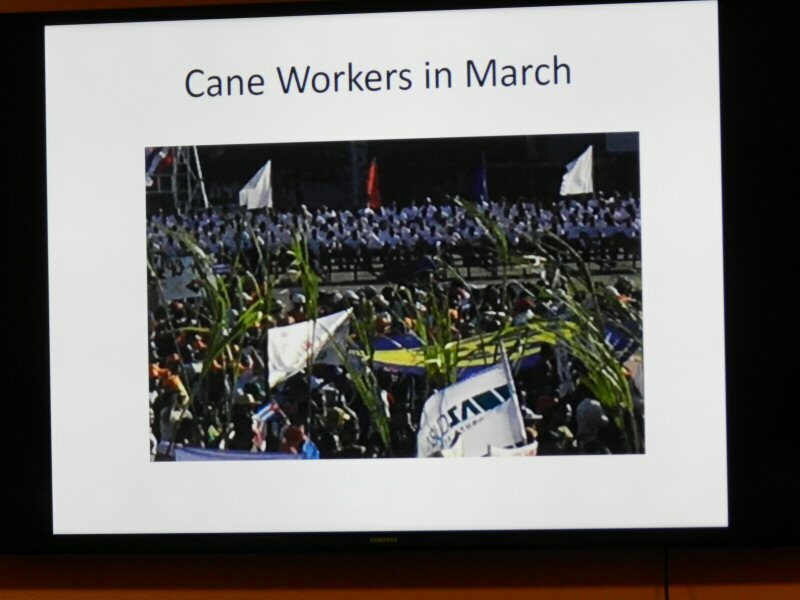 Ms. Camp’s husband, Bill Camp, was a labor organizer and the delegation was invited to Cuba by the Cuban Labor Secretary for the annual May Day celebration. 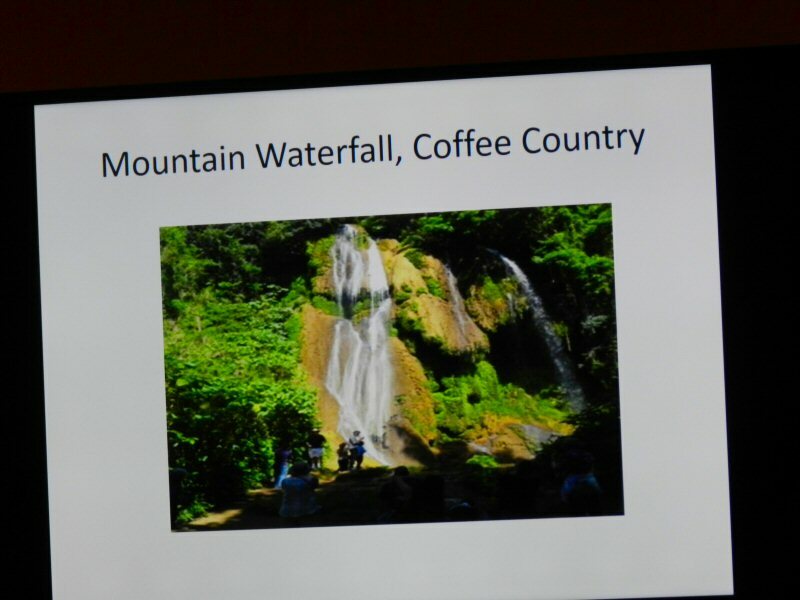 On Thursday, Septpember 22, Ms. Camp, gave a slide show to the Rotary Club of Burney-Fall River sharing some of her experiences and reflections on the trip. She began by saying that travel restrictions are easing. She needed a visa from Cuba and proof of health insurance. The group flew from Sacramento to Miami and then to Havana. The plane was technically a charter flight operated by United Airlines. Camp said that she has heard that more and more new flights are opening up. It is still illegal for US banks to do business in Cuba, so they could not use US credit cards. Canadian credit cards work but not US. So they had to take cash and exchange it for pesos. Cuba has two currencies. There are the pesos that the Cuban people use and there are “convertible pesos” for the tourists. Camp said that the people welcomed them as Americans, eager to have them spend their dollars and convertible pesos. Cell phones with US service providers also do not work in Cuba. Lots of Cubans have cell phones with other networks but US service providers still are not allowed to provide service in Cuba. Prices were moderate. The group stayed in a hotel so they could all be together. Rooms were about $100 a night. Meals also were not expensive. Many times they ate at paladars. 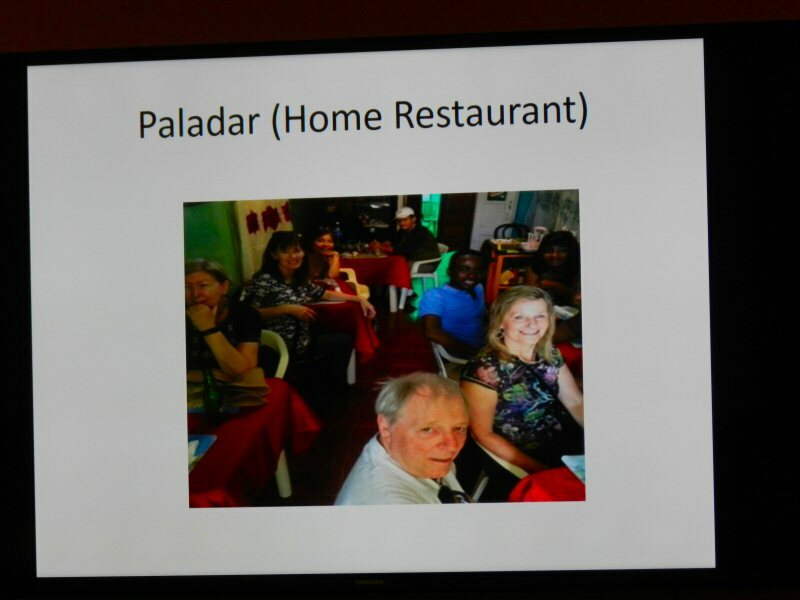 A paladar is a restaurant that a family operates in their home. Camp showed us a slide of one such home restaurant. The food was very good with lots of fresh seafood and vegetables from the markets. 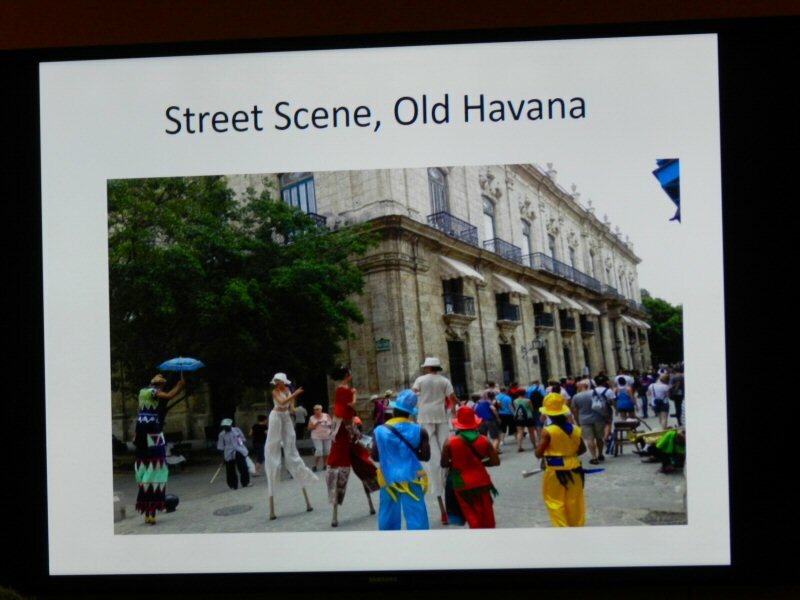 She showed some pictures of Havana’s seaside boulevard, the Malecon. At the time that she visited there was not a lot of traffic because they were just finishing the filming of the last Fast and Furious movie. Speaking of cars, she said that she saw some nice old classic cars from the 1950’s. Otherwise, most of the cars on the streets were Russian or Chinese. Some of the buildings in the Malecon now house bed and breakfast units that are quite inexpensive for visitors. Also, Camp said that there was music and art everywhere. Music in the hotel, music in the restaurants. At night people come out by the sea wall at the the Malecon to watch the sunset, stroll, visit with friends. Some people sit out on their porches and play guitar, relaxing after a day’s work. 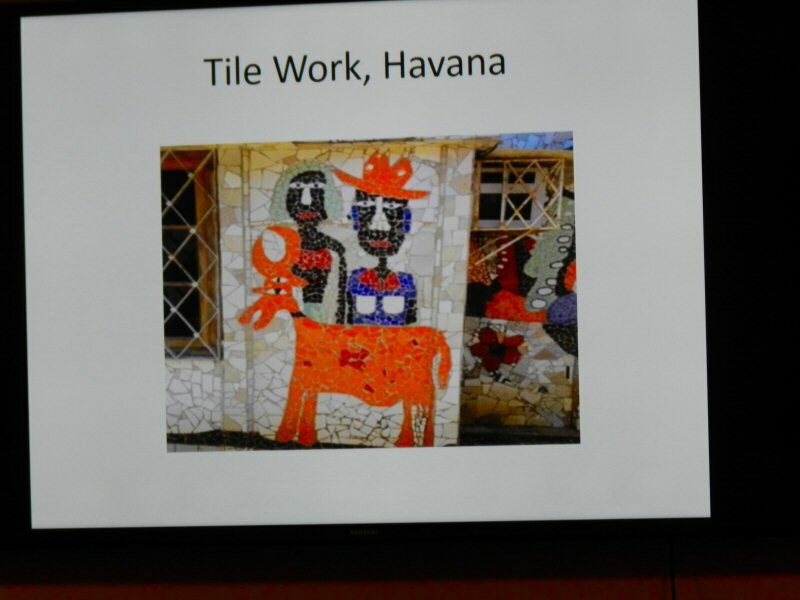 As an example of art that decorates the city, Camp showed a slide of tile art decorating the side of a building. 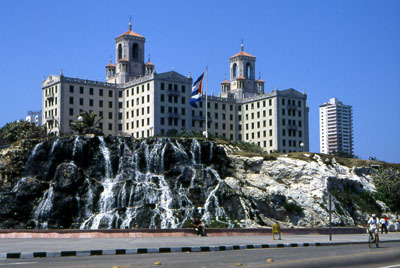 The group also visited Old Havana, which has been designated as a World Heritage Site. Camp said that the government has been investing a lot of money on restoration and preservation of this historic site – 45% of the money going for buildings and 55% to restore old neighborhoods. Another historic site that she talked about was the Hotel Nacional de Cuba, which has an incredibly rich history including movie stars, heads of states, and mobsters. In response to questions, Ms. Camp said that the streets were all very clean and that she felt very safe walking about in the city in the evening with a friend. In addition to their time in Havana, the group also had the opportunity to visit Trinidad, a town founded in 1516. Trinidad has been a World Heritage Site since 1988. Though the site was founded in the 16th century, most of the architecture is from the 18th century. They took a trip into coffee country in this vehicle. and they visited a beautiful waterfall that reminded her of home. After describing some of their experiences in Havana, Trinidad, and the countryside, Camp briefly talked about more political topics. 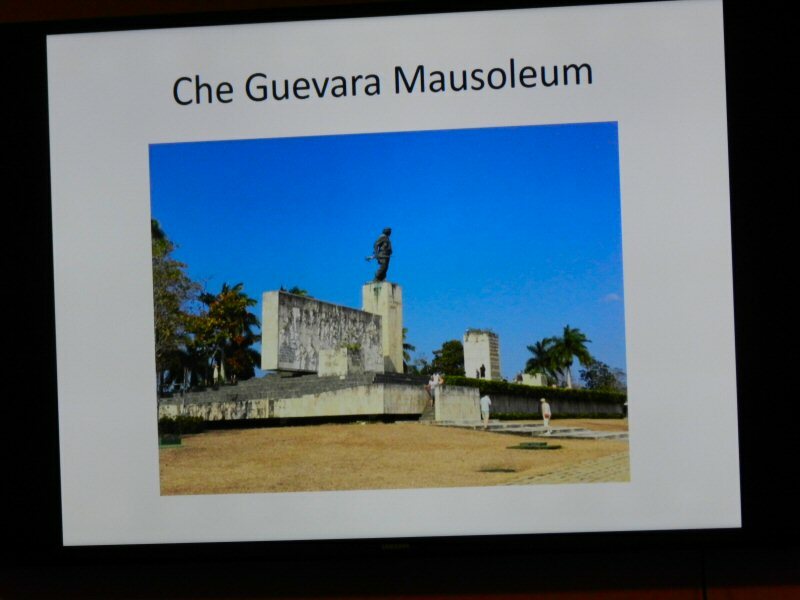 She showed a slide of the Che Guevara mausoleum. The she described their experience at the May Day Celebration. Her delegation had thought that they might march in the Workers Day March. Instead they were seated below the pavilion where Raoul Castro was seated, watching the parade pass before them. President Raoul Castro did not speak. He watched the parade and waved. 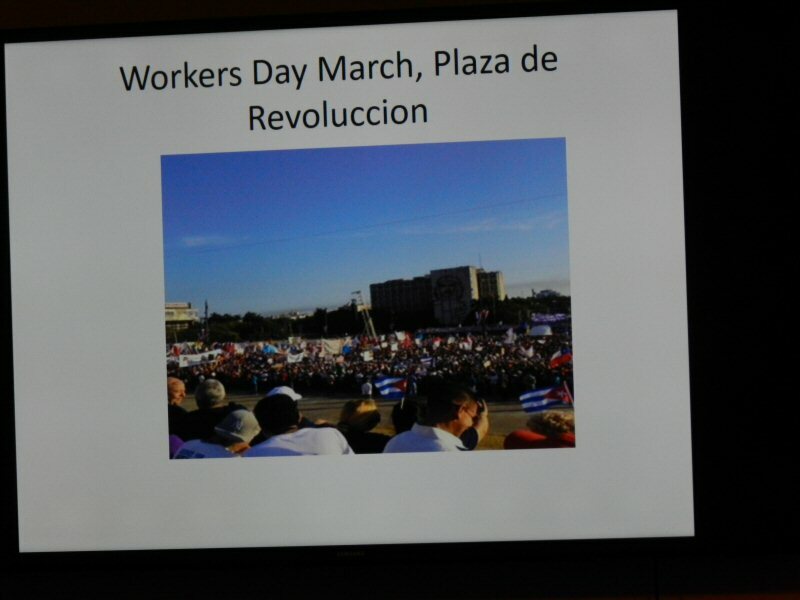 Ulises Guilarte, General Secretary of the Workers’ Central Union of Cuba, spoke briefly. In the past, Fidel Castro used to give speeches that lasted up to seven hours at the May Day celebration. The highlight of the parade was the march of workers who strode through the streets for more that two hours. The official government figure for the number of marchers was one million. The following day, May 2, the delegation attended an international conference together with labor groups from around the world. A representative from each country gave an analysis of the political situation in their country. A delegate to the event from Maryland gave the analysis for the United States. Camp ended her talk by saying that the Cuban people with whom she talked expressed a strong sense of community and solidarity. They felt that they had survived all of the difficulties that the United States had confronted them with, including the Bay of Pigs, alleged involvement in some anti-communist terrorist activities, and the trade embargo. During the period following the collapse of the Soviet Union in particular they had gone through a rough time. They had survived it all and they were very proud of their accomplishments in healthcare and education. On the day that the delegation left Cuba, the first American cruise ship was arriving in Cuba. A new era in US-Cuban relations is beginning. 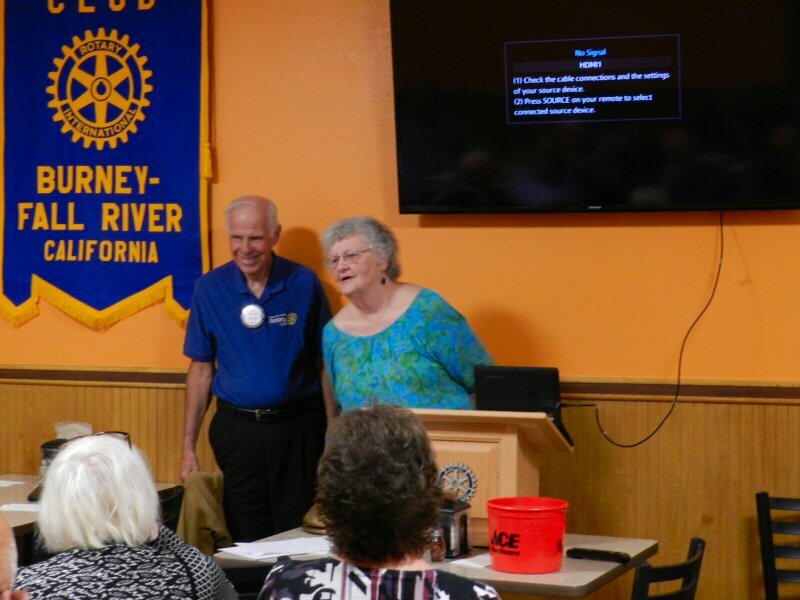 Thanks to Catherine Camp for such an interesting and informative talk and thanks to the Rotary Club of Burney-Fall River for providing such interesting speakers at their meetings.